Where are you? Home > Reviews > Blind Boys of Alabama - "Take The High Road"
Our bodies constantly renew and recreate themselves, cells forming, living and then dying to be replaced by new cells. We can say we’re such-and-such an age but our actual bodies are far younger; and yet somehow we’re still ‘us’. We are as much a concept as a physical reality. This is music with integrity. And so it is with certain bands that have endured the decades. The members come and go until they are largely or entirely replaced, but the music, the vibe, the uniqueness, the spirit of the band remains. The Blind Boys of Alabama have only one original member left, founder and lead singer Jimmy Carter, and yet are as every bit as authentic today as they ever were. This is music with integrity. I listen to them now and can still hear that same band I heard decades ago - the Blind Boys’ sound. And there’s something very comforting about that. Nothing wrong with having your own sound and style. And their continued popularity and the huge respect they command reflects the “if it ain’t broke, dont fix it” concept. But that doesn’t mean that, like those little cells, they don’t renew themselves or even branch out in new directions every once in a while. And so it is with their new album. Jimmy Carter had long wanted to do a country gospel recording and this is the first in their 70 year career! This album is a little gem of artistry and passion. Last year whilst in Montgomery, Alabama, ready to be inducted into the Alabama Music Hall of Fame they met a young Country music traditionalist, Jamey Johnson and invited him to sing “Down By The Riverside” with them at the ceremony. The reaction convinced them that it was worth exploring the territory shared between Country and Gospel and so they asked Johnson to produce an album with them. 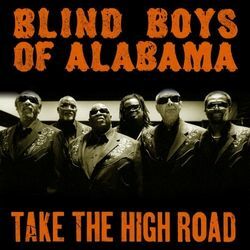 The result, “Take The High Road” recorded live in just a few days in Nashville, Tennessee, works because - as the liner notes state - Johnson’s goal was “not the act of production for its own sake, but the art of making and capturing great music for music’s sake”. And that’s my kind of music! This album is a little gem of artistry and passion. The Blind Boys perform just as you’d expect them to: rich, majestic, assured. There’s a confidence and comfort in their delivery that only comes from years of living the music, till every cell in your body vibrates to the frequency of life. Magic. I can almost taste the red dirt soil of Alabama, and I’ve never been anywhere near it! Jamey Johnson and the Blind Boys of Alabama are joined on the album by some great names of Country music too. Willie Nelson, Hank Williams Jr, Vince Gill, Lee Ann Womack and the Oak Ridge Boys all sign up to add their unique talents. I particularly enjoyed the Oak Ridge Boys downhome singalong on the title track, Vince Gill’s rhythm and bluesy version of “Can You Give Me A Drink” and Lee Ann Womack’s soulful rendition of “I Was a Burden”. And a shout out for the band of A-list Nashville top studio musicians too - the unsung foot soldiers of all recordings like this - who play with true skill and conviction, under Johnson’s relaxed but watchful eyes and ears. they prove again and again that they are a quality act. But trust me it’s the Blind Boys who are the real stars. On the six tracks they do on their own they prove again and again that they are a quality act. “I Know A Place” is a tune that rejoices in the use of timing and space to tell it’s story to perfection. “Jesus Built a Bridge to Heaven” might only have been recorded last year but takes us back to anytime in the last hundred years or so. Even if you don’t know any of these tunes the old standard “Stand By Me” will please with it’s ramshackle beginning and uplifting pacing and message, and the country-rock groove of “Jesus Hold My Hand” is pure americana at it’s very best. ...pure americana at it’s very best. But don’t worry you don’t have to be religious to enjoy this album - even a crusty atheist like me can revel in the exuberant musicality and inborn spirituality revealed within. I might not believe in a god, but I certainly appreciate the fruits of human achievement. Pluck this album from the shelf and let the juices run down your chin!